A while ago I was asked if I wanted do a review of the products from the newly established male grooming brand Scaramouche & Fandango. To be honest with you, I had to think about it a couple of times before I accepted, basically for the reason that I wasn't sure if I could write anything sensible about shampoos, conditioners and shower gels. What persuaded me though was the fact that this brand which had only been around for a year and a bit, had been accepted into big stores like John Lewis, Selfridges, Fortnum & Mason and many more. The Scaramouche & Fandango shampoo was also nominated for best haircare product at the 2014 male grooming awards. According to my logic then, this brand was likely to have come up with some quite good products and it would be a shame if I didn't take this opportunity to try them out. Body wash, Shaving cream, Face scrub and Hydrator. The Scaramouche & Fandango product range consists of three shower products: shampoo, conditioner and body wash, and three shaving products: shaving cream, face scrub and hydrator. I have used these products for a couple of weeks now and I believe I have enough information to review them. Starting with the shower products, I don't really have any complaints or negative experiences with them at all. As I hinted about above, talking in detail about shower products is not something I have much experience with and I also think I'm lacking the proper terminology for it as well. So, what I will present here is a lay persons view of these shower products, but since the potential buyers are nearly exclusively lay people, this might just do the trick. For me, there are a few points which set good shower products apart from the less good or outright rubbish products. Firstly, how long does the product last? Sometimes it feels like you have to use large amounts of shower products for them to have the desired effect, but with good quality products a little splash is enough and thus the product will last longer. Secondly, do the products leave you with a proper feeling of being clean? Many products leave you feeling oily or sticky after use, and there are few things that bother me more when it come to these kinds of products. Thirdly, how do the products smell and how intense is the smell? If I don't like the smell or if the smell is too intense, I am not likely to use it more than once. So, how do the Scaramouche & Fandango shower range fair with regard to these simple criteria? The answer is, Very Well, I'm pleased to tell you. These shower products are efficient and long lasting, they leave you feeling perfectly clean and the smell is so discreet that it is very unlikely to bother anyone. When it comes to the Scaramouche & Fandango shaving range, I find it to be more of a mixed bag. I don't mind the face scrub but I have used better. Some of the reasons for using a face scrub are: removing dirt, oil and dead skin cells, lift tough beard hairs and prevent ingrown hairs, and improve the shaving experience and diminish shaving irritation. To do this properly, I think the face scrub need to have a real scrubbing effect. Although this face scrub does a decent job, it could do with a bit more scrub for me to be perfectly happy with it. The shaving cream is the one product in the Scaramouche & Fandango product range that I like the least. For me, it just doesn't do the job properly. When I first used it I thought it looked promising as the cream is quite thick, but I also noticed that it seemed a little dry and that is the main problem with this shaving cream. The main job for a shaving cream is to have a really nice lubricating effect so the razor glides effortlessly over the skin, but this cream just doesn't do that to an extent I'd be pleased with. To make this a good shaving cream, it needs more of whatever lubricating agent is used in this product, or possibly another one. The last product, the hydrator, is the highlight of the Scaramouche & Fandango shaving range. I really like the silky softness of the hydrator as it is applied to the skin, and how it makes the skin feel refreshed and soft for a long time. The hydrator is a an excellent product. The last thing I would like to say about these shaving products is that, just like the shower range, the smell is very discreet and is not likely to offend anyone's taste. The travel pack with four of the products and a wash bag. 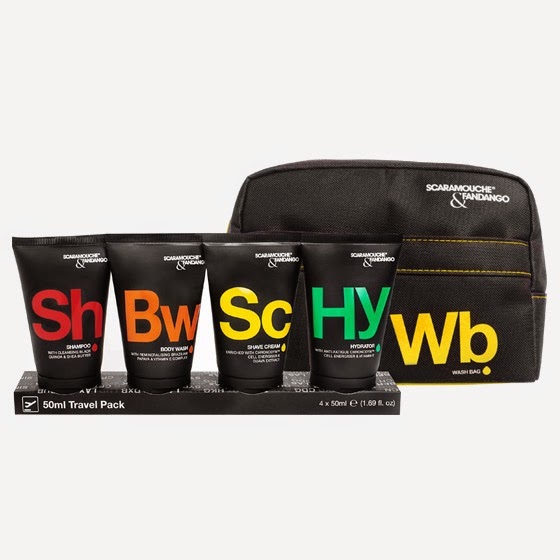 Lastly, I would like to mention that Scaramouche & Fandango offer what they call a travel pack. This comes with four of the products, the shampoo, body wash, shaving cream and hydrator, and also includes a nice sturdy wash bag. Each of the products come in 50ml tubes which means they can be put in your carry on luggage. Very practical if you're a frequent traveller and like to travel light.